Trauma is one of the leading cause of death in western countries, especially within forty-five years of age. Patients with major trauma, whole body Ct has become a routine practice and default imaging. Various studies suggest improved outcomes and also high negative outcomes. As there is no national guidelines exist or scoring system to quantify the trauma. Whole body CT is done to decide on early treatment and discharge from hospital. However, there are concerns about the number of negative scans and risks of radiation induced cancer. To identify whether we are overusing whole body CT service, and find out whether we could safely reduce the number of scans without missing significant injuries. A retrospective data on whole body CT performed on trauma patients in our hospital from December 2017 to April 2018 were collected. Majority of them were young male patients and the number of scans with no injuries were more than fifty percent. Average radiation dose is 1837. The majority of trauma CT scans showed no injury at all. Several studies have shown that whole body CT for trauma does reduces the length of hospital stay and permits early diagnosis, but this is associated with a high radiation does especially important in children. The average dose for Whole body CT is 25 mSv. This according to government data gives 1:800 risk of life time cancer and this is increased two fold for paediatric population to about 1:400. IRMER demands all investigations utilising ionising radiation must be justified. At present there are no clear guidelines as to determine which patients require CT scan. CT scans may be performed not because there is a high clinical risk of significant injury but rather to avoid missing injuries and for quick diagnosis and early discharge. This is causing unacceptable radiation burden on the population. We are considering dividing trauma patients in to conscious and unconscious. For conscious patients with minor injuries use of whole body CT scan should be carefully considered. Whole body CT should not be a screening study for trauma but used to evaluate specific and appropriate body areas . We are aware that there is good evidence that whole body CT scan has a survival benefit in patients with serious injuries but the less severely injured patient and the uninjured patient must be protected from unnecessary radiation exposure. 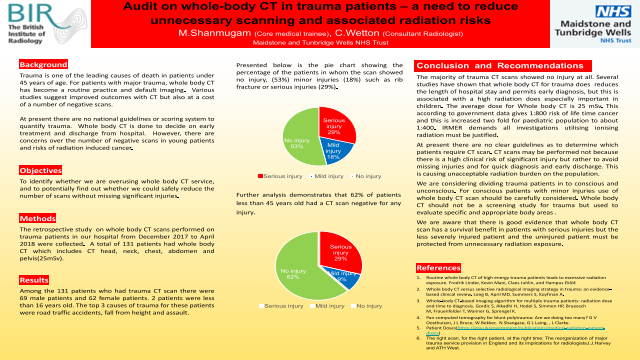 Summary: A poster to describe the the need to reduce unnecessary Whole body CT in case of Trauma Patients. References: Routine whole body CT of high energy trauma patients leads to excessive radiation exposure. Fredrik Linder, Kevin Mani, Claes Juhlin, and Hampus Eklöf. Whole body CT versus selective radiological imaging strategy in trauma: an evidence-based clinical review. Long B, April MD, Summers S, Koyfman A.
Whole-body CT-based imaging algorithm for multiple trauma patients: radiation dose and time to diagnosis. Gordic S, Alkadhi H, Hodel S, Simmen HP, Brueesch M, Frauenfelder T, Wanner G, Sprengel K.
Pan computed tomography for blunt polytrauma: Are we doing too many? G V Oosthuizen, J L Bruce, W Bekker, N Shangase, G L Laing, , L Clarke. The right scan, for the right patient, at the right time: The reorganization of major trauma service provision in England and its implications for radiologistsJ.J.Harvey and ATH West.